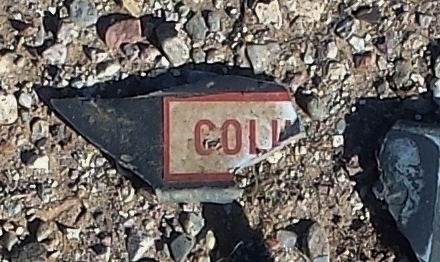 Found this at an F-104G crash site and cant figure out what it says. Couldn't find it on the external markings. It's a decal. Maybe internal warning. Appears to be "COLU" then is broken off. It's a little smaller than a business card, black-painted background. This one crashed in Arizona but did spend some time in Germany as a fighter-bomber with JaboG 31. Had been reassembled by Messerschmitt. So maybe it was a decal in German. The aircraft had a collision with the ground!